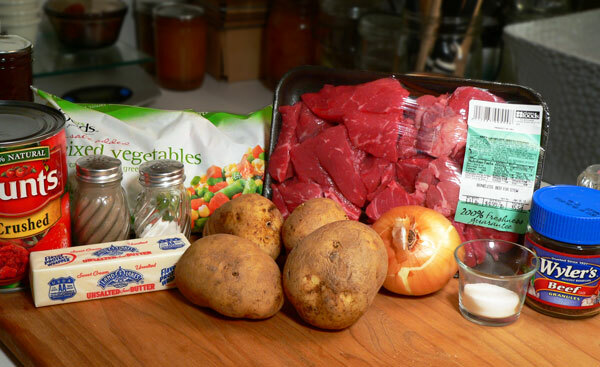 Follow our step-by-step, photo illustrated recipe for making this hearty Vegetable Beef Soup. Nothing seems to satisfy the tummy and the “soul” on a cold day better than a bowl of warm soup. Add some saltine crackers, a sandwich of choice and, you’ve got a meal that will have you all warm and cozy in no time. This past weekend, we experienced a brief respite from the cold weather of the past several weeks. Temperatures on Saturday and Sunday climbed back up to around 72 degrees and had folks back in shorts. This evening, as I write this, only 4 days later, I’m switching between writing and watching the weather forecast for our area. You see, at this moment, the weather forecasters are calling for SNOW. It’s expected to reach us around 10:00pm this evening and, they say we could see anywhere from 1 to 3 inches…or more. This may not be a big deal for those of you further North but, where I live, any call for snow is a call to hunker down. We’ve had rain all day today and the temperature will drop to just below freezing before sunrise on Friday morning. We’re more concerned about the “ice” than the snow. Even a thin sheet of ice on the highway can cause some serious driving and walking conditions around these parts. We always hear our officials telling us that if we don’t have to be out…don’t go out. Yet, the biggest majority will not heed the warning. I’m getting old now….I will listen closely. It’s true what they say about “the bigger they are, the harder they fall.” I speak from experience…trust me. I’d been wanting some Vegetable Beef Soup for a couple of weeks. It just turned off too warm to actually make it though. 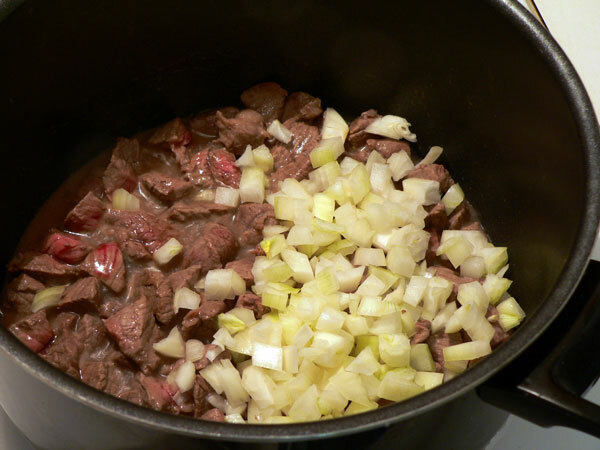 So, when the temperatures were forecast to drop back down at the first of this week, I headed out for some stew meat to add to the soup. I actually made this on Monday and enjoyed a good deal of it. The remainder, went into the freezer for another “cold” day. Looks like I need to get out another carton. Cold winter weather is fast approaching. I made this soup using a 2lb. bag of frozen Mixed Vegetables. It’s not very “soupy” but you could easily add a little more liquid if you desire. It’s just a good, hearty soup, filled with vegetables and, it’s perfect for a snowy day…anywhere. You’ll need a big pot but that’s OK. The good part is that you can have some now….and….some for later. And, it’s really, really good. Ready to give it a try? 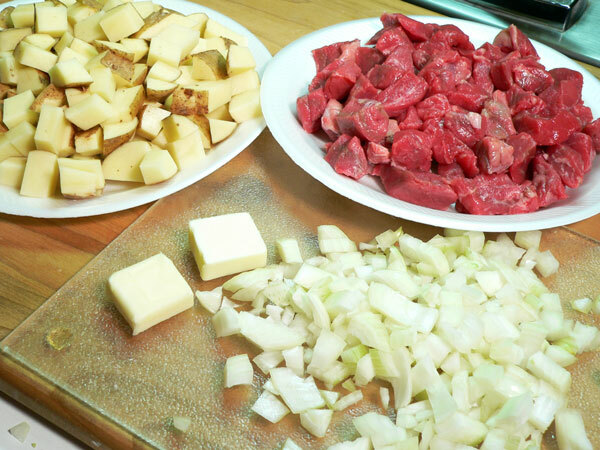 OK then….Let’s Get Cooking! 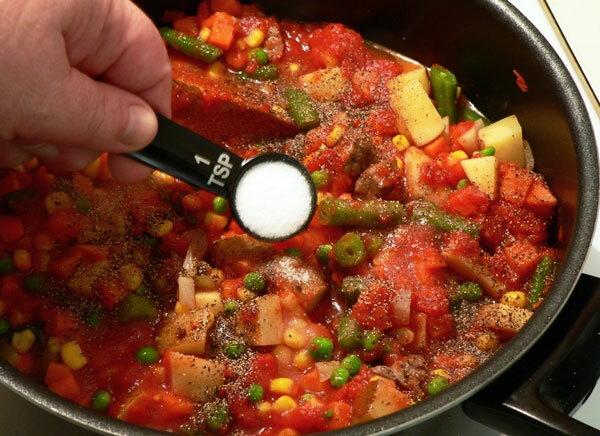 Vegetable Beef Soup Recipe: You’ll need these ingredients. You’ll also need a can of Tomato Sauce. I’ve included it in the printable recipe below but, I somehow managed to leave it out of the photo. I must apologize for that. I’ve also mentioned some Texas Pete Hot Sauce….that’s optional though. I purchased a package of “Beef for Stew” as they call it. It’s already cut into chunks but I didn’t want anything quite that big so, I chopped each piece into smaller pieces. You could use sirloin, chuck or, even hamburger if you prefer. Whatever is on sale is the way I figure. I used about 4 small potatoes. I washed them, sliced them, cut them into strips, then into small diced portions. Yes, I left the skins on. I like that “rustic” look. It just makes the soup all the more “hearty,” I think. If you don’t like them, no problem, just peel them off. It’s your soup. I chopped up one medium sized onion. You can do this as you go along through the process. I just went ahead and prepped the items needed so they would be ready for their photo debut. You’ll need a good sized stock pot to make this. Place it on your stove and set the heat to about Medium. Add the butter as it begins to warm up. Add the beef on top of the butter. Once you get to this point, you could go ahead and dice up your potatoes and onions if you haven’t done so already. We’re going to brown the beef a little and this will take a few minutes. Don’t brown it too fast or let it burn. Brown the beef on all sides, stirring it once the bottom starts to brown a bit. Stir it often so it’s not sticking to the bottom of the pot. Let the onions cook for a couple of minutes. Stir them around as you go. Add the mixed vegetables. Again, I’m using a 2lb. bag of frozen Mixed Vegetables. Soup is a great way to use up any leftover vegetables you have. 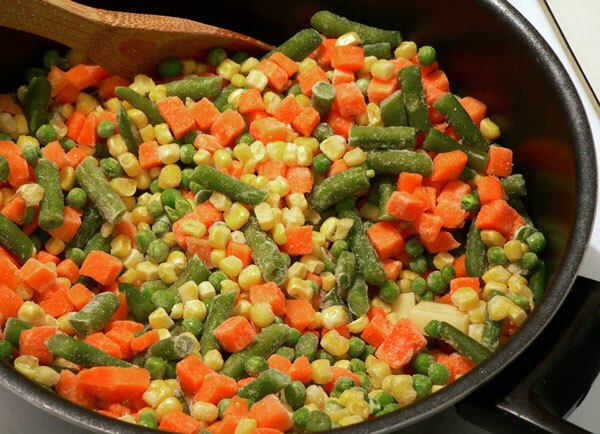 If you have space in your freezer, designate a container for keeping leftover vegetables. Then, as you have leftovers from a meal, add them into the container. Once you’ve got a bunch of various vegetables saved up….make soup. Waste Not – Want Not. Right? Here again, a quart jar of “canned tomatoes” from the pantry would have been great. I’m talking about some fresh tomatoes you might have “jarred up” over the summer. I did have a jar but opted to go with the store bought canned variety. Add the salt. We’ll start out with a teaspoon. You’ll certainly want to taste this after it’s cooked and adjust the salt to your own taste. I added more to mine towards the end. Better to go slow and add it as you go than to add too much. Give it all a good stir. Then, cover the pot with a lid. Reduce the heat down to a Medium-Low. The soup will need to cook at just a low simmer for the duration. It took me just over 3 hours to cook this pot of Vegetable Beef Soup. I checked it about every 30 minutes or so, stirring it each time. 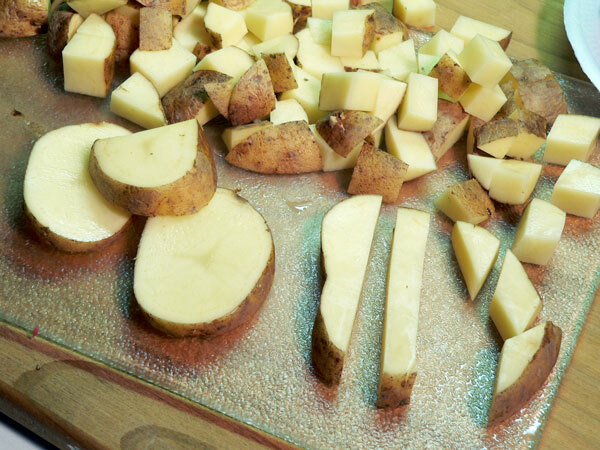 You just need to let it cook until the potatoes are tender. 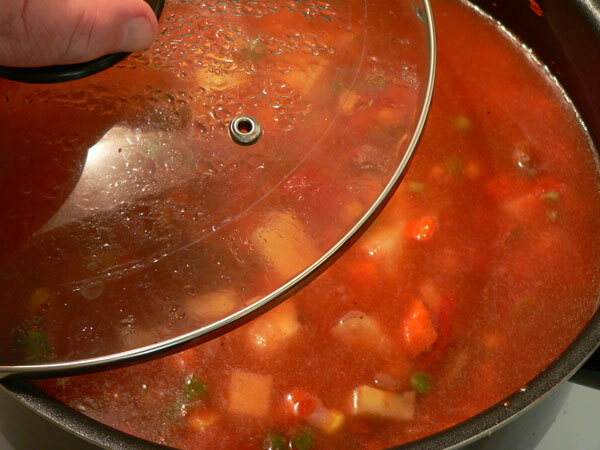 If you keep a lid on the pot and let it cook slowly, you shouldn’t have to worry about the amount of liquid in the soup. I like mine thick and hearty. 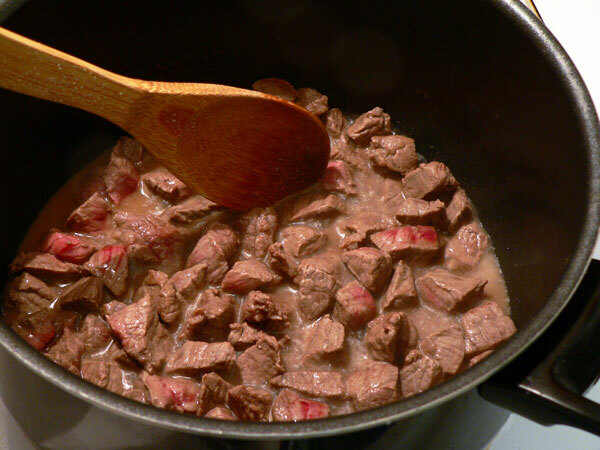 If you prefer a little more “soup” in your soup….just add another cup of beef broth. Once the potatoes are tender, you’re good. 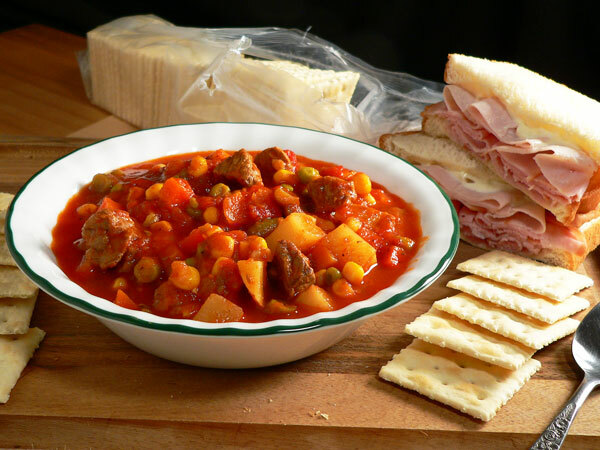 Serve the soup good and warm along with some saltine crackers and your favorite sandwich. It’s sooo good…and really warms the soul. I like to crumble my crackers into the soup itself. A grilled cheese sandwich is good too. Also, I didn’t show it but, I added about a teaspoon of Texas Pete Hot Sauce into the pot. That’s a personal preference. If the whole family doesn’t enjoy it, just add it to your own bowl and stir it in good. It just adds a little “oomph” to it I think. I had this Vegetable Beef Soup on Monday, then placed the remainder into serving sized containers. I popped those in the freezer but….with this forecast for snow tonight….I think I’ll go ahead and pull one out. It looks like it’s going to be good weather for some tasty soup. Enjoy! 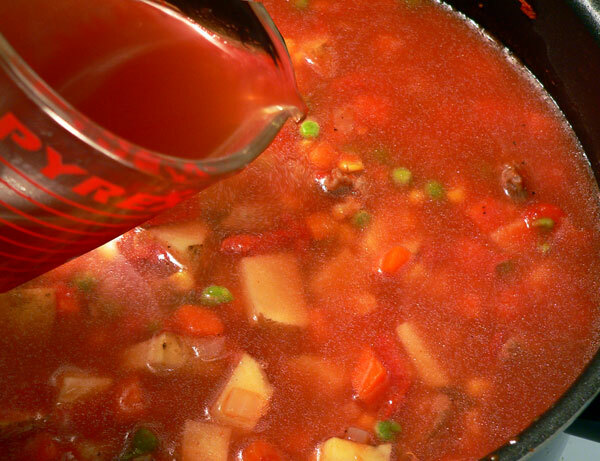 Follow our step-by-step, photo illustrated recipe for making this hearty Vegetable Beef Soup. Nothing seems to satisfy the tummy and the “soul” on a cold day than a bowl of warm soup. 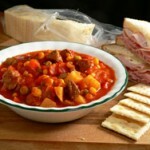 Add some saltine crackers, a sandwich of choice and, you’ve got a meal that will have you all warm and cozy in no time. 1 Bag of Frozen Mixed Vegetables, 2lb. 4 cups of Beef Broth, canned or made from granules. 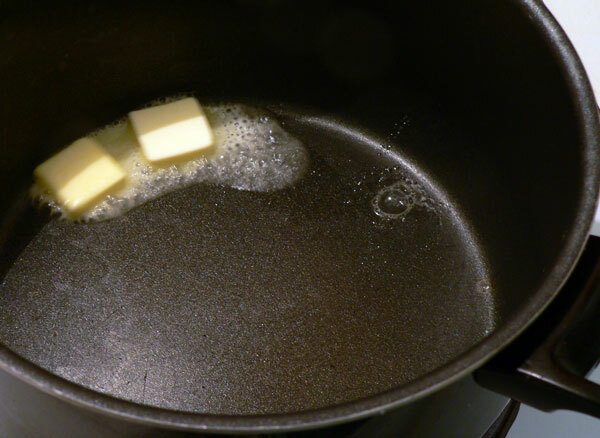 Place butter in a large stockpot over medium heat. 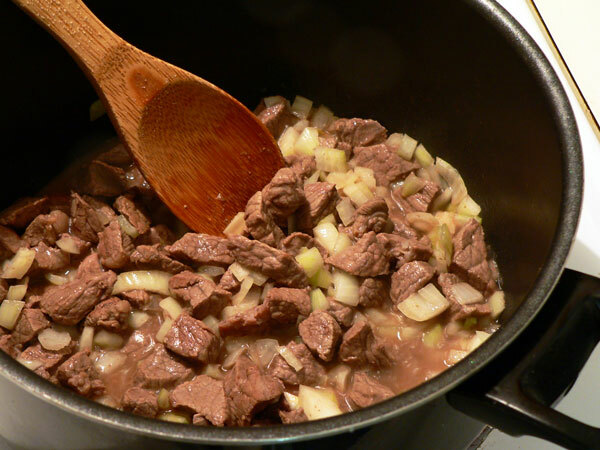 Add meat and cook until lightly browned, stirring and turning constantly. Stir well, let come to light simmer, reduce heat to medium low. Cover pot and let simmer about 3 hours or until potatoes are done. Serve warm with crackers or grilled cheese sandwiches and enjoy! 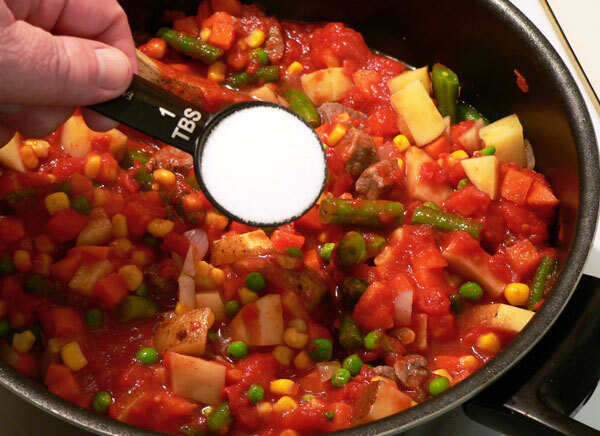 This is a great way to use leftover vegetables. 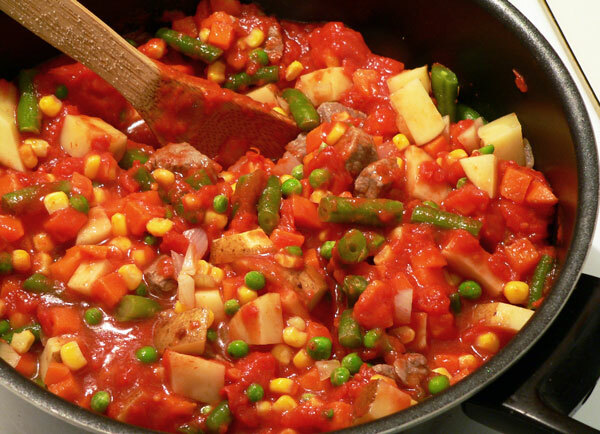 Just start a container in your freezer and add leftover vegetables as you have them available. Then, toss them all in the pot and cook up some hot and tasty vegetable soup. You could also easily cook this in a crockpot if you have one. Your Comments: Do you like cold weather and cold weather foods? Or, do you prefer walking barefoot in the sand? 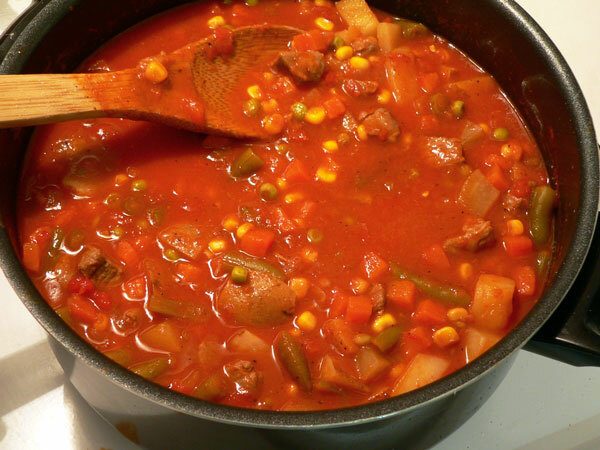 I do hope you’ll give our recipe for Vegetable Beef Soup a try. I think you’ll find it’s very easy to prepare and, if you freeze some for later, you can have an even quicker meal the next time around. If you give it a try, leave us a comment in the section below and let me know how your soup turned out. Please note that all comments are moderated. That means, I read each and every one of them. I also try to respond to as many comments as possible so come back again and see our reply. It’s the only actual way we have of knowing that you stopped by. 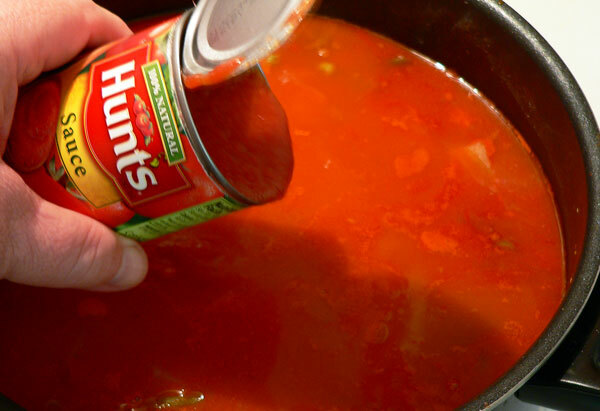 Share some of your favorite “cold weather soup” stories with us below. I’d love to hear from you. Thank you again and, I do hope you’ll stop by for another visit real soon. Hi Steve, I just found your site and your recipes look delicious. 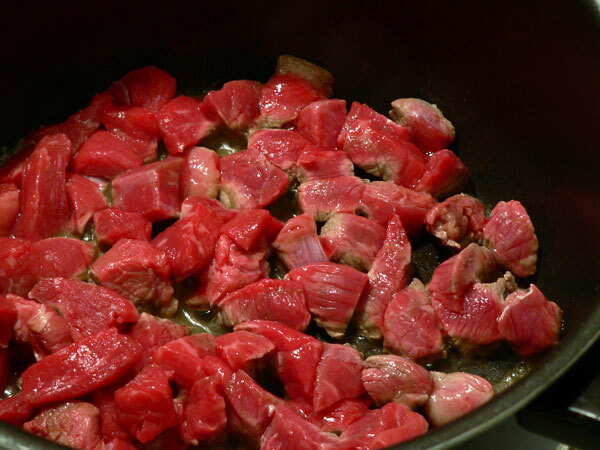 I am looking for a good vegetable beef soup recipe that I can use leftover pot roast in. How would you modify this recipe to do that? I am just starting to cook after 4 years of being disabled from a fall. Have had 2 hip replacements in the past year, one 30 days ago and looking forward, lol, to two knee replacements and possibly back surgery this year. It is wonderful, however, to be able to start getting around, although somewhat limited, and start cooking again. I will definitely be trying more of your recipes. Thanks so much. Good evening, Steve, had to let you know cooked your Vegetable Beef Soup today. It was sooo-goood!! I have been making vegetable soup for a few years, with a lot of different recipes, but they just did not taste like I remembered Mama’s tasting finally gave up on soup. After reading your recipe knew that the difference in those recipes and yours is the SUGAR and not a lot of spicees. Mama always, like your Mama, added a little sugar to her vegetables. I remember one of my older sisters asking me once why I was adding sugar to some vegetable, my reply, “because Mama did” the sister did not think much of my answer but it was the only one I had. Back to your recipe it was delicious and will be kept and used when I want vegetable soup again. Have just finished putting the leftover in the freezer, good eating ahead. Enjoy your website and have been spending about an hour or so each night looking at your recipes. God bless and help you keep up the good work. Made this soup today and it was delicious. I thought I followed it exactly as I took the printed recipe to the grocery when I purchased the ingredients. After I had everything put together it was much thinner than the picture shown on the web site. When I re-read the ingredients I used 4 cans of beef broth instead of 4 cups. Since my soup was thinner I added a teaspoon of cajun seasoning (as I didn’t have any hot sauce) and a half package of a 12oz. Kluski noodles during the last hour of simmering. We liked it so well that I think I’ll again make it with Kluski noodles. This recipe is a keeper. Made the beef soup for my grandgirls they really enjoyed it ate 3 bowls at supper time it was cold that day. Thanks love all your recipes. Hi Steve. Made the soup yesterday for last night’s dinner. It was awesome. Brought back great memories of cold school days and walking home to a nice big bowl of Mama’s delicious soup. Thanks for your recipe. It was right on time! Oh my goodness, that looks great. No snow or ice down here, but some of my children and grandbabies live in the Blue Ridge Mts and are enjoying some snow. I like hot sauce in my soup, too. But where we live it comes already mixed in whether you ask for it or not. I just copied your Collard recipe. I over cooked mine Christmas. For the fun of it, I grew some collard plants in several large flower pots where I had grown tomatoes plants. I had forgotten my Mother said really fresh and tender collard leaves did not take as long to cook. My Mother added Cornmeal dumplings to her collard, green beans, and summer soup. I am the only one that eats the dumplings at my house. My mother would think up ways to get her children to eat vegetables one way was to make what I call summer soup. 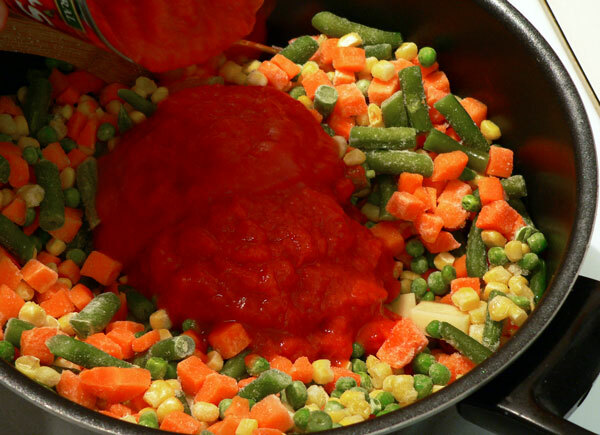 You are supposed to use fresh vegetables, but sometimes I cheat, and use canned tomatoes, frozen butter beans and white shoe peg corn. I always use fresh green beans, corn, Lima [butter beans]and canned tomatoes. You season it with streak-of-Lean, but I think the special flavor is the Cornmeal dumplings you add just before it is finished cooking. Make sure the broth is simmering rather fast or the cornmeal will break apart. 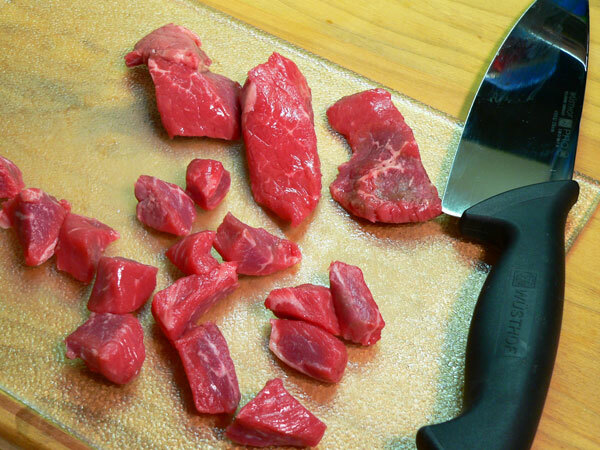 I buy the very lean meat and trim some of the fat off. I have started putting a little flour in the cornmeal because it seems MEDIUM CORNMEAL is not as course as it used to be when I was growing up. Pleases try this special soup. Hi Margaret, Thank you for sharing your comments with us. My mom would make cornmeal dumplings with her collards sometimes, and would sometimes make her “pastry” with the cornmeal dumplings instead of rolled out flour. We called the rolled out flour “pastry,” and the cornmeal was “dumplings,” at our house. Steve, do you have a recipe for stewed tomatoes, where you use white bread broken up in pieces with sugar and either fresh or canned tomatoes? I cannot remember if you add diced onions to the dish. Thank you for you lovely Web site. God Bless your good works. Tried this recipe as written and it was delicious. Tried it again but substituted chicken for the beef. I boiled 4 thighs seasoned with just salt and pepper. I placed the pot in the fridge overnight. The next morning I skimmed off the solids, shredded the chicken and then followed the original recipe. I used the stock from the boiled chicken. I think I did pretty well. This soup looks exactly like the way my mama use to make it here in NC. I have made different versions of this soup and I’m going to make it exactly like this recipe this coming week. Grocery store, here I come! This is great! My husband just had 4 teeth pulled and a denture put in and I was looking for a yummy vegetable soup . Yours did the trick! My husband is finicky about his food, and he loved this. God bless and keep you and your family and have a Merry Christmas! I made this tonight with ground venison and it was delicious! My first ever attempt at vegetable soup and my husband said it was just as good as his mama’s! Thank you for the easy recipe! Thanks for the terrific recipe. I made two minor adjustments: I added a couple of finely minced cloves of garlic with the onion, and only used 1 package of vegetables (my pot wasn’t big enough for two). It was still very hearty and really hit the spot. I grew up in Ohio, but moved to NC about a year ago. I’ve always been good at comfort foods, so my cooking style fits in quite nicely here. Your site has many recipes I plan on trying. Especially eager to try Salisbury Steak. It has been difficult for me to find a decent recipe for it. Thanks again! Try the Salisbury Steak! It’s AMAZING! I added onion powder and dehydrated onion to the burger in addition to the called for ingredients. We made more burgers later the same way for the grill. Lightly seasoned- perfect! 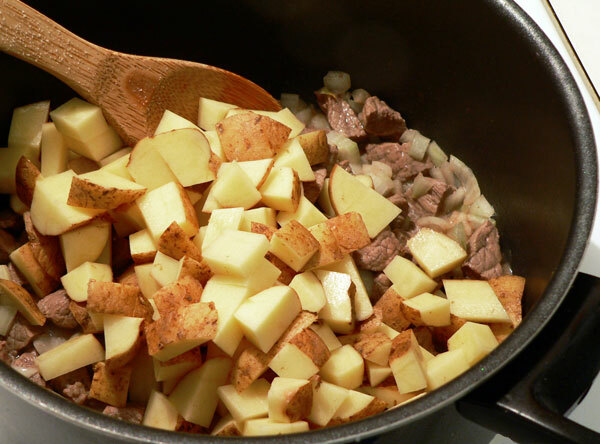 For a quicker Vegetable Beef Soup I used canned diced potatoes. Taste the same either way to me. Just didn’t require a long time to cook. Didn’t add the salt or sugar since I used all canned ( store bought ) vegetables. I prefer to use home grown vegetables when I can. Have been taking a stab at cooking off and on more now that I have been retired from the Navy for a little over 5 years. Hi Daniel, First, Thank You for serving our country. I hope you know that there are many of us who sincerely appreciate your service. This was Amazing, best recipe ive found for this soup. Ive tried several but they havent hit the spot, but this one sure did!!!! Thanks!! Hi Ashley, “Amazing” is a big word, but I greatly appreciate it. I’m thankful you found the recipe and gave it a try. I’m very glad that you liked it. 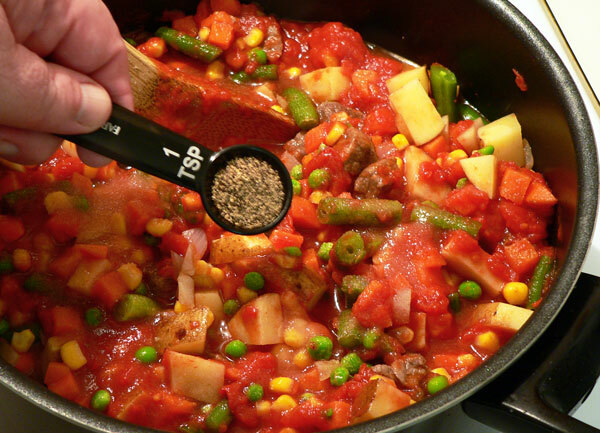 Your Vegetable Beef Soup looks really delicious. 😉 I make a vegetable beef soup that is very similar. These is nothing better than soup on a really cold day! Hi Michael, Thank You for your comment and your visit today. We’ve had some really cold days, and nights around here lately, and you’re right about the soup on a really cold day. This recipe reminds me of a stew my grandma used to make all the time years ago. It’s almost exactly the same but you use beef broth and crushed tomatoes and she used tomato paste and water to flavor it. She had a stroke a few years ago and went to live with my uncle (her son) and his family in a another state. I always wanted to get her recipe but her memory isn’t as good as it used to be so I had no idea how to make it. Anyway, I think your recipe will do the trick. I normally make this kind of soup with one of those little packets of seasoning they sell at the grocery store but with the sodium content being so high in those mixes, I’m trying to stay away from them. Since we’re still in winter, this recipe would be perfect to make on a cold day. Thanks for posting it. Also, how big is the pot you used to make it? I used to have a big pot that’s about ten quarts but it’s rusted in places so I can’t use it anymore. Would a five-quart pot be large enough? That’s the largest I have. Hi Nicole, Thank you for your question. I’m using a 5qt pot myself in the pictures. It worked out fine for the amount of soup that I made. I do hope you’ll try the recipe and let me know how it turns out for you. You’re right, it’s really good on a cold winter day. We’ve got a weeks worth of cold weather headed our way and I might just have to make up a batch for myself. I’ll be adding a recipe for Brunswick Stew in the next week or so. It’s much thicker than this soup and uses chicken and pork barbecue along with some vegetables. I just wanted to thank you for the soup recipe. I made it a few times over the winter after my last comment and it tastes just like my grandma’s soup. I haven’t had it over 8 years so it was nice to recall my childhood and when my family and I were living with her. Thank you so much. God bless you.